In a decision that should not come as a big surprise, a US Federal Court judge has determined that the location of data under Microsoft's custody is not relevant. If Microsoft can produce it, it is required to do so. As reported in Computerworld, the decision relates to a search warrant that directed Microsoft to produce the contents of one of its customer’s e-mails, where that information is stored on a server located in Dublin, Ireland. Microsoft contended that courts in the US cannot issue warrants for extraterritorial search and seizure, but the judge denied Microsoft's motion to quash the warrant. It argued, in part, that a US court can't issue a search warrant for premises outside of the United States so they should not be able to do so virtually. This case, for some Canadian readers will be reminiscent of the Canadian Federal Court decision in eBay Canada Ltd. v. M.N.R., 2008 FCA 348, where the Court ordered eBay in Canada to turn over information about Canadian "powersellers" regardless of the fact that the data was not within the territorial jurisdiction of the Court. Microsoft is appealing this decision, but for now it stands for the proposition that the location of data is largely irrelevant in determining whether a government can order it to be turned over. The location or nationality of the custodian is much more relevant. Charmaine Borg, the NDP's digital issues critic and the most activist MP in the area of privacy has tabled Bill C-580 to update the federal Privacy Act to require breach notification and a mandatory 5-year review of the Act. More info here: LEGISinfo - Private Member’s Bill C-580 (41-2). In the wake of so many privacy breaches by federal government departments, I can get onboard with this. According to the Financial Times, Microsoft is going to break from the pack of other cloud service providers by agreeing to store data locally. FT.com content is behind an annoying paywall, but here's the gist of it along with some commentary. Microsoft will allow foreign customers to have their personal data stored on servers outside the US, breaking ranks with other big technology groups that until now have shown a united front in response to the American surveillance scandal. Brad Smith, general counsel of Microsoft, said that although many tech companies were opposed to the idea, it had become necessary following leaks that showed the US National Security Agency had been monitoring the data of foreign citizens from Brazil to across the EU. This decision seems to be based on (or appealing to) the fiction that the location of data is somehow determinative of whether law enforcement or national security folks can get access to data. As I said, it's mostly a fiction. Governments can assert control over things, or people, or entities on a number of bases. One of them is the presence of the thing (a server) in the physical jurisdiction, but most importantly is the presence of the person who can obtain and hand over the data. ... Some critics of the idea have questioned whether such a move would be effective in putting the personal data of non-Americans outside the reach of the NSA, since US tech companies have to hand over information about specific users when ordered to by a secret US court, regardless of where it is held. While this isn't really a solution to the principal problem that many people associate with the USA Patriot Act and the FISA Amendments Act, it may be an economically rational decision since many customers will only ask where the data is, rather than what it really means. I do agree, however, that the big question which is the driver behind all of this needs to be addressed at a government-to-government level. Mr Smith also said that the US and EU should consider signing an international agreement that ensures they will not try to seek data in each other’s territory via technology companies. Today, the Office of the Privacy Commissioner of Canada posted a "Fact Sheet: Privacy and Outsourcing", which leads to two resources depending on whether you're looking at the public sector (Privacy Act) or the private sector (PIPEDA). Organizations need to make it plain to individuals that their information may be processed in a foreign country and that it may be accessible to law enforcement and national security authorities of that jurisdiction. They must do this in clear and understandable language. Ideally they should do it at the time the information is collected. Once an informed individual has chosen to do business with a particular company, they do not have an additional right to refuse to have their information transferred. When personal information is in the hands of a third-party service provider operating on foreign soil, it is subject to the laws of that country and no contract can override that. This could mean, for instance, that the organization may be obliged to respond to a subpoena or other mechanism that would give law enforcement officials access to personal information. This has consistently been the position of the OPC, starting with a PIPEDA finding from 2005 when the Commissioner said that a bank should (not must) advise customers that the processing of data will be outsourced to a US service provider. I have to note, though, that PIPEDA doesn't contain any actual obligation to provide such notice. So I'm not sure where the obligatory language from the OPC's new fact sheet comes from. In any event, the fact sheets do provide useful information about the OPC's take on cross-border outsourcing. The Government of the UK has just announced its "Cloud First" policy. The government has confirmed that it has adopted a 'Cloud First' policy, making it mandatory for buyers of IT products and services in central government to consider purchases through the cloud as their first option. Cabinet Office minister Francis Maude said that the policy will drive wider adoption of cloud computing in the public sector, boosting business through the G-Cloud programme's CloudStore, and ensuring the public sector buys IT in a 'quicker, cheaper, more competitive way'. According to the Cabinet Office, as of now, when they buy new or existing services, public sector organisations should consider and fully assess potential Cloud solutions first, before looking at any other option. A statement explained, "This approach is mandated to central government and strongly recommended to the wider public sector. Departments will remain free to choose an alternative to the Cloud if they can demonstrate that it offers better value for money." Alongside today's announcement, the third iteration of G-Cloud (G-Cloud III) is going live today, with 708 firms offering over 5,000 services listed on the new framework- up from the 458 suppliers and 3,000 services on G-Cloud II when it went live last October . Maude said, "Many government departments already use G-Cloud, but IT costs are still too high. One way we can reduce them is to accelerate the adoption of Cloud across the public sector to maximise its benefits. "The Cloud First policy will embed the skills a modern civil service needs to meet the demands of 21st-century digital government and help us get ahead in the global race." The policy has been under consideration for some time, with G-Cloud programme director Denise McDonagh suggesting at a roundtable in March that Maude was likely to give it the go-ahead. McDonagh, who has long advocated a 'Cloud First' policy, said, "Sales from G-Cloud are rising steadily, with cumulative spend now over £18 million - two-thirds of it with SMEs. This is still small relative to overall government IT spend, and the transition to widespread purchasing of IT services as a commodity won't happen overnight. "The adoption of a Cloud First policy will give added impetus for Whitehall and the wider public sector to move in this direction - complementing our ongoing work to encourage Cloud adoption and to help buyers adapt to this way of purchasing IT, which is already showing results." US federal agencies have been operating with a cloud first policy since December 2010, and a number of other countries are believed to be considering instituting similar directives. The Electronic Frontier Foundation is reporting that a US Federal District Court judge in San Francisco has ruled that National Security Letters are unconstitutional as a violation of the First Amendment of the US Constitution and the separation of powers. The Judge's order has been stayed for 90 days to permit the federal government time to appeal. National Security Letters (NSLs) are a form of administrative subpoena that can be issued by a senior official of the FBI, which requires the recipient to provide non-content or transactional information and is usually accompanied by a gag order. According to EFF's media release, Judge Susan Illston ordered that the FBI stop issuing NSLs and cease enforcing the gag provision in this or any other case. A copy of the Judge's decision is available here, also on the EFF website. 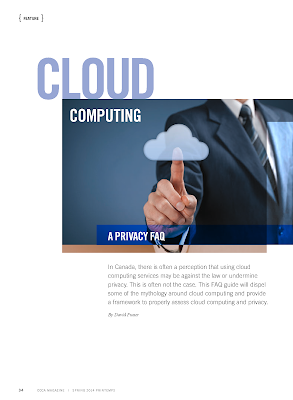 The Privacy Commissioner of New Zealand has released a checklist for businesses and a guidance document [PDF] to about cloud computing. Here is the Commissioner's summary of the two documents: Cloud computing guidelines. Location - where will the information be? Use and disclosure - who sees the information and what will it be used for?